Jeremy KushnierI first met Jeremy Kushnier a few years ago when I got to interview the cast of Bucks County's production of Rocky Horror. Prior to Rocky Horror, I saw Jeremy go on in the most recent Broadway revival of Jesus Christ Superstar. It was then that I was like, wow what a voice! I'm so excited to catch up with Jeremy as he is keeping audiences guessing as to whodunit in America's longest running comedy, Shear Madness, which has descended on New York City, playing at New World Stages (340 West 50th Street, between 8th & 9th Avenue). Click here for tickets and follow the show on Facebook, Twitter, Instagram and at http://nyc.shearmadness.com! 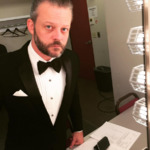 For more on Jeremy be sure to visit http://jeremykushnier.com and follow him on Twitter and Instagram! 1. Last time we spoke you were starring in Bucks County's production of Rocky Horror. Now you are starring in, Shear Madness, America's longest running comedy. What is the most exciting part about being in a whodunit show? I love the idea that you really have to be present at every moment because you never know what is going to happen. Also the challenge of convincing an audience that it wasn’t you is a lot of fun! 2. What do you relate to most about your character "Eddie Lawrence"? I think the poor guy is very misunderstood. It's a challenge in daily life to change peoples perception of you and that's something I think "Eddie" is doing through this play. It's definitely something I try to do in life. From left to right: Jordan Ahnquist, Lynne Wintersteller, Jeremy Kushnier, and Kate Middleton in "Shear Madness", Photo Credit: Carol Rosegg3. Shear Madness is a very audience interactive show, where the audience helps figure out who the killer is. What challenges do you face as an actor with this nightly change in the script? What do you enjoy most about this kind of audience interaction? I think the idea of keeping the show fresh and staying on top of how you interact with the audience while still making it seem of the cuff. There's a fine line of looking like you know too well what you’re doing and it looking completely improvised that we try to tread. It's all a challenge. We like to say that the audience is our 7th company member and they just happen to have no idea their lines or the play in general, and that makes it a bit of a challenge as well. 4. Since Shear Madness is heavily based upon audience participation, what has been the craziest thing to happen so far? We never say audience participation we say audience interaction because truly you can be as involved or uninvolved as you like. Audience participation makes a lot of people run for the hills, me included. The craziest thing for me is how much that New York audiences want to be involved. Our audiences have been on it and super excited to be a part. Kate Middleton and Jeremy Kushnier in "Shear Madness", Photo Credit: Carol Rosegg5. One of my favorite games growing up was "Clue." I loved figuring out who killed who, in what room, and with what weapon. Shear Madness is very similar. If you were to be the star of "Clue," who would you kill, with what weapon, and in what room? Probably Mr Green (cause I love Michael McKean) in the Library with the revolver. 6. If Shear Madness were to merge with Rocky Horror, who and how would "Riff Raff," who you played, commit murder? He would definitely convince "Magenta" to do it for him or just sing really high and loud till they took their own lives. 7. Since Shear Madness is a whodunit, what mystery in your life are you still trying to solve? How to make the perfect martini. 8. In addition to theatre, you also have released two solo albums. What do you get from making music that you don't get from your theatrical ventures? I like the idea of having total control over the end product. It's very cathartic for me to write my own music. You know we don’t always get to be as artistically involved as we'd like to be in our own lives. So writing music gives me that outlet. Jeremy Kushnier as "Eddie" in "Shear Madness"9. What's the best advice you've ever received? "Shut up and do your job." Honestly. I was in rehearsals for Footloose and I called a good friend and mentor because I was very scared that I wasn’t going to be able to do it. I was feeling nervous. I had never been the lead of a big show like this let alone on Broadway and I started to doubt myself. He just reminded me that I had been acting for over a decade at that point and I knew what I was doing. And that nothing about where I was or what I was doing was any different than what I had done before. And to shut up and do my job. 10. What theatre stars inspire you today? I think anyone who does this as a career is inspiring to me. There are so many people in the theater that are a complete wonder to me every day. But the people that inspire me the most are the ones that love the theater so much that they glow even when they speak of it. My girlfriend Robin Abramson is one of those people. She is an amazing actress and has inspired me to love the theater again. She receives such a genuine joy from theater that it is contagious to be around her. One of my favorite things to do on the planet now is to go and sit in a theater with her and enjoy the fact that we live in the center of the universe when it comes to theater. 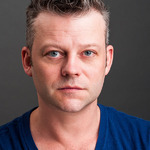 Jeremy Kushnier most recently portrayed "Iago" to critical acclaim in Pittsburgh Public Theater's production of Othello. He was nominated for a 2015 Drama Desk Award for Best Actor for his portrayal of "Leo Szillard" in the musical Atomic. On Broadway he covered "Jesus," "Judas" and "Pilate" in the most recent production of Jesus Christ Superstar, played "Tommy Devito" in Jersey Boys, "Ren" in Footloose and "Roger" in Rent. National tours include "Radames" in Aida and "The Doctors" in Next to Normal, "Tommy Devito" in the Chicago, Las Vegas, and Toronto companies of Jersey Boys. His most recent TV credits include Person of Interest, The Good Wife and the series finale of Nurse Jackie. Jeremy has released two independent albums of all original music.